Almost all metals will eventually corrode underwater. That's normal. However, if your propellor (and the propellors of everyone nearby) is severely corroded during a single season, obviously something has gone seriously wrong somewhere! Auto Corrosion is the corrosion of a metal in an electrolyte - a process self-induced by the inherent imperfect characteristics of the metal - as a simplification, this can be imagined as the mixture of iron and oxygen resulting in rust. Contact Corrosion is a common source of galvanic corrosion; two dissimilar metals in an electrolyte solution cause one metal to dissolve while the other appears unaffected. Externally Induced Corrosion is caused when an external electrical current causes a metal to become an anode (therefore dissolving). 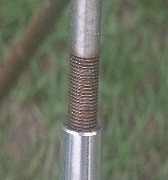 This behaviour is similar to Galvanic Corrosion but is electrically induced. Auto corrosion happens to just about any metal when uncoated and exposed to the elements. There are ways of cleaning, coating and protecting so-called pure metal (such as aluminum, bronze, and brass hardware). You can find these products on our Metal Cleaners and Waxes category. Almost all metals will eventually corrode and break down in the presence of an oxidant. However, we have all seen that some metals corrode faster than others. Corrosion-resistant metals are called "noble metals" and are often highly valued for these properties, such as gold, platinum and silver. Highly active metals (ie, corrosion-susceptible) are aluminum, zinc, magnesium. When two dissimilar metals are in contact with one another and placed in an electrolyte (an electrically conductive substance, ie water, especially salty or acidic water), an electrical current begins to flow from one metal to the other (just like the plates of a battery) due to the migration of electrons. This action is called Galvanic Corrosion. The metal that loses ions is called the "anode" (as it is the electrode from which an electric current comes from) and the metal gaining the electrons is called the "cathode" (as it is the electrode into which an electric current goes). Galvanic corrosion will eventually lead to the complete and utter disintegration of the anode! Which metal will become the anode, and which will be the cathode? As you can imagine, in a potential galvanic corrosion situation, the metal that is highly active (ie suspectible to corrosion) will become the anode, while the noble (corrosion resistant) metal becomes the cathode. For example, if you screw an aluminum nut onto a steel bolt and place them in a bowl of saltwater, the aluminum nut will eventually corrode, while the steel bolt will appear unaffected. However, if you replace the aluminum nut with a platinum nut, the steel bolt will be the one to corrode! Externally induced corrosion is very similar to galvanic corrosion but is induced by an external electrical current. In marine electrical systems, stray currents often exist - in other words, a movement of charge-carrying particles from one section to another, not unlike sheep escaping from the farm if the gate is left slightly ajar. This movement may be subtle and go unnoticed for long periods of time, causing relentless corrosion of your boat’s underwater metal parts. If your thru-hulls become severely corroded, it could sink your boat - and we've seen damage like this occur within 4 months! These stray currents could also be significant and pose a serious health risk to anyone on or swimming around your boat. Stray currents are more common than one might think and are are often caused by improper electrical grounding, either from shore supply systems or connected boats, or even a short circuit in just the right (or wrong!) location. A short circuit in a bilge pump, for example, could travel to a ball valve, then to a thru-hull. If these metals are disimilar (one is bronze, the other stainless steel for example), this could be the perfect storm for catastrophic externally induced and/or galvanic corrosion issues. A similar situation actually sunk a nuclear submarine in the 1960s! Step One: Determine the source and stop it! Stray electrical currents could be originating from a short circuit on your boat. It could be a neighbouring boat. It could be the marina's entire electrical system. An experienced marine surveyor or marine electrician should be able to help you determine what's happening. Products such as Marinco's G30 GalvanAlert power cord can be attached to your shore power cord and will alert you if there are stray currents in your system. The G30 will help you prevent stray currents from occuring in the first place. Perhaps you and your marina friends can try it on each boat's connection to see if the issue is widespread or isolated to one offending shore power connection. Step Two: Install a Galvanic Isolator! Galvanic isolation is used in situations where two or more electric circuits must communicate, but their grounds may be at different potentials. It is an effective method of breaking ground loops by preventing unwanted current from travelling between two units sharing a ground conductor. Galvanic isolation is also used for safety considerations, preventing accidental current from reaching the ground through a person's body. Yachts connected to improper grounded shore supply systems should employ a galvanic isolator to isolate from any stray currents in the marina (either from the shore mains or neighbouring yachts). Without the isolator, a galvanic corrosion path may be created damaging metal equipment below the waterline. Anodes may help to prevent this, but often prove insufficient when the yacht stays in the marina for extended periods. Step Three: Connect all underwater fittings to a common ground! According to Raymond Toth of Swiftsure Marine Suveyors, on a fibreglass boat you should electrically connect all underwater fittings to a common ground point (the main DC negative bus). If a bronze thru hull is electrically connected (with a conductor of suitable gauge) to a stainless prop shaft, they are now at a common potential (or at the same voltage) and any fault current stays aboard the vessel. The danger in owning a vessel that has all its underwater fittings isolated (no green bonding wire installed to the fitting and grounding point) is that they are all at different potentials and freely communicating. Add a 20+ year old bilge pump or water pump (like most boats on the water today, and presto, you have a corrosion quadrangle! Ironically, most pleasure craft builders in Canada gave little consideration to grounding and bonding. 95% of all vessels Raymond inspects have little or no bonding or grounding. As these boats continue to age, major corrosion issues will be more prevelant. Bonding of all AC & DC equipment and underwater fittings will not only keep you alive, it will keep you afloat! Step Three: Check your anodes! 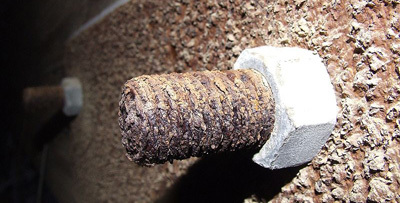 It could be futile if dealing with a major electrical issue, but "normal" corrosion can easily be prevented with anodes. Which type of anode are you using? Sadly, many freshwater boaters refer to anodes as "zincs". This is a huge problem; zinc anodes do absolutely nothing in fresh water. For the sake of eavesdropping boaters, don't call them zincs! Zinc anodes are only effective in salt water. Freshwater boaters should use magnesium. Brackish water calls for aluminum anodes; in fact aluminum outperforms zinc in salt water applications as well. If you've got a badly corroded propeller and your anode looks pretty good, you've probably got the wrong anode! How do anodes work? Visit our anode page to learn about how anodes use galvanic corrosion to actually prevent corrosion from occuring elsewhere on your boat!